I was taken with wonderment with a sight of a Peace lily pleasingly potted in a kettle. Check the image here. A warm laud for the organisers for this thoughtful invite. The lily has comforted itself on the entrance table. 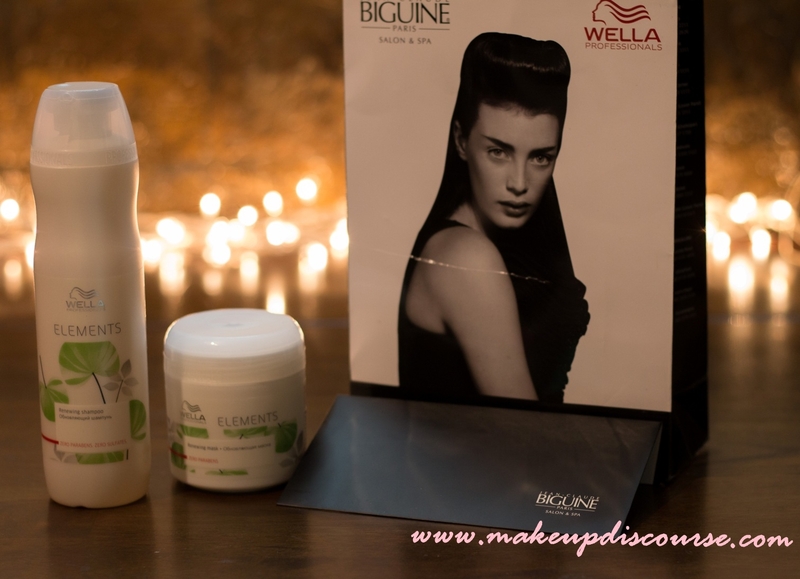 Wella Professionals Elements Range Launch Event was held at House of Tales, Kalaghoda. The Guest Panel had Dr.Kerstin Meyer - Lipp and Brand Ambassador, Nimrat Kaur. Wella Professionals Elements Range is Free of Sulphates, Artificial Colorants and Parabens. And the fragrance has an impression of the green woods of Amazon forest. Wella Elements Range is inspired by the Beauty and Strength of Trees. The Range claims to provide more vitality & strength against breakage. The Range is Sulphate free, artificial colourants free, and Paraben free. The exclusivity about this range is NuTREE Complex developed by the R & D experts at Wella. NuTREE Complex, a natural tree essence enriched with antioxidants which help in the reduction of free radical damage. It also acts as anti-irritant and helps balance the scalp. Panthenol or ProVitB5 penetrates into deeper shafts to reconstruct the Keratin structure and binds in moisture. Healthy, smooth and nourished hair are no longer a dream. To further simplify, Wella Elements Range reconstructs and protects the Keratin from degeneration, breaks the hair life cycle by prolonging or renewing your hair strands. Apart from the fundamental details about the Elements Range, Dr Kerstin Lipp, conferred her glimpse on Sulphate & Paraben Free Products that it is a growing trend and more and more people are looking for natural products without or few chemicals. With discussion, Actress & Wella Brand Ambassador, Nimrat Kaur turned vocal about her experience on using Organic or Sulphate free products. She mentioned she prefers Organic, Paraben free and Natural products with her lifestyle where she needs to travel to different places with different temperatures. And heat styling her hair often that leads to breakage and brittleness. She further specified that the Elements Range resulted in shiny, smooth and amazing smelling hair. Wella Elements Range can be purchased from Jean Claude Biguine, Affinity, Bodycraft, Toni & Guy , Bodycraft, Strands, Tresslounge and Headturners. * I have already switched to No-Shampoo Method, and it has been more than 2 years now. A research into the depth of ingredients, foaming agents and results will follow soon. I am excited to try these products as soon as I empty my current products.